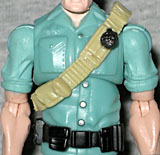 It seems 1987 was a banner year for GI Joe mailaways. We already told you about the Steel Brigade, and that was the year The Fridge showed up, too. 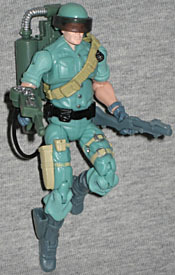 And if that weren't enough, GI Joe Action Stars Cereal had an offer for the Joes' Jet Pack Trooper, Starduster. Skyduster was a circus trapeze artist before he enlisted in the Airborne Rangers. He found that his acrobatic skills and boundless energy came in handy when swinging from a 150-foot rope. Except, of course, this "audience" was throwing more than just popcorn and peanuts at him. It was Duke, however, who recognized how well this death-defying act would work with the GI Joe team's jet backpack. The combination has been a crowd-pleaser ever since. 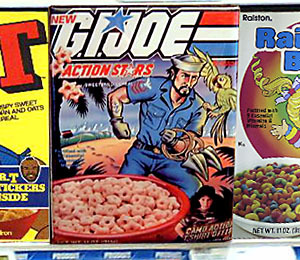 Action Stars was one of the myriad terrible cereals produced by Ralston in the 1980s. We've already told you about the culinary holocaust that was Teenage Mutant Ninja Turtles Cereal, and Action Stars wasn't much better. In fact, it had been around for two years by the time the Starduster offer started to show up, finally forcing the kids of America to beg their parents for a minimum of three boxes. And then the next year he was offered directly from Hasbro, making the consumption of all that ungodly cereal moot, and teaching us an important lesson about patience. Now Starduster is back (with a new name), and he's much easier to get. The original Starduster was a mish-mash of re-used bodyparts, so the G3 style of limb-swapping works perfectly for his G3 equivalent. He's built from pieces of four figures, but I bet you can't pick which ones - being repainted baby blue helps disguise their origins. Okay, so the real breakdown? Clutch's feet, Snake-Eyes' thighs, Duke's torso and the retooled Flint arms. On the plus side, he manages to look unique; on the down side, he has a holster on his boot and a sheath on his leg that will remain empty, because the figure doesn'thave any accessories to fill them. Actually, sorry, I was wrong: he's made from five figures; his head originally belonged to the Comic Pack #1 Hawk. But since there was nothing of value in that comic pack, this might as well be a new mold. The original toy shared his head with Hawk (and, thanks to the rampant 1982 mold-swapping, also with Steeler, with Short-Fuze and with perennial nobody Flash), so maybe this was an intentional choice. In any case, Skyduster - whose real name is Edward J. Skylar - looks pretty angry here. Isn't he supposed to be having fun? Answer? Yes. As mentioned above, Skyduster has been painted blue, tan and grey. His pants could have used a camo paint app to really re-create the classic look, but it's not like there's any mistaking who this is meant to be. He has a tan sash with a black grenade molded over his heart, and the visor on his helmet is a smoky grey. The helmet is loose on his head, which is particularly odd since it also came with the terrible Hawk that originated the mold, and honestly, the figure looks better wearing one of the other helmets that are included in this set - wish they'd given him one. Whenever a figure has to be renamed, I always wonder what the reason is. Is there really some other toy out there called "Starduster" that's meant this one has to be called "Skyduster," or is it something else? Mystery! 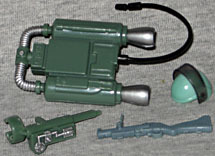 In any case, Skyduster gets the same JUMP jetpack and control pad that the Cobra Air Trooper enjoyed, and a gray version of the grenade launcher that came with Gung-Ho. Good stuff, all around. Skyduster is only available in the Toys Я Us-exclusive GI Joe Air Command box set, paired with Ace and Wild Bill. I certainly didn't care about those two figures, so I was very pleased to get the whole thing on sale for little more than the cost of a single figure - after all, I was just buying it for one guy, so paying for all three seemed like a ripoff. And while I am happy with Skyduster, I was also pleasantly surprised by the other two figures in the set. The GI Joe Air Command has a lot to offer, so don't hesitate to pick it up.